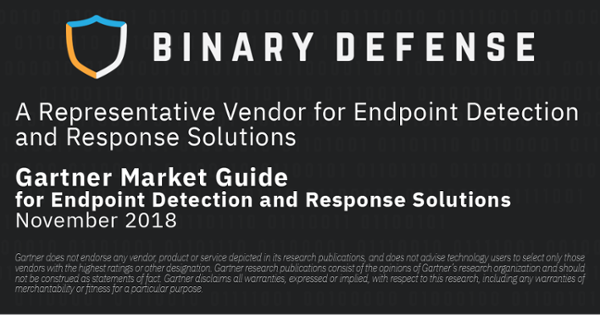 Binary Defense, a leading provider of Endpoint Detection and Response (EDR) and Managed Detection and Response (MDR) services, is happy to announce it has been identified for the second year in a row as a Representative Vendor in the Gartner “Market Guide for Endpoint Detection and Response Solutions” report. According to the guide, “By 2025, 70% of organizations with more than 5,000 seats will have endpoint detection and response (EDR) capabilities, up from 20% today.” Binary Defense has been a foundational part of the growing EDR service industry since 2012 with our Binary Defense Vision Platform that integrates with existing security teams. Source: Gartner, Inc. “Market Guide for Endpoint Detection and Response Solutions” by Peter Firstbrook, November 26, 2018.